April 26, 2007 – Decades of struggle by members of the IAMAW and other international unions and their members have resulted in significant improvements in working conditions. But the toll of workplace injuries, illnesses and deaths remains enormous. Each year, thousands of workers are killed and millions more are injured or diseased because of their jobs. The IAMAW and other international unions of the AFL-CIO remember these workers on April 28, Workers Memorial Day. The first Workers Memorial Day was observed in 1989. April 28 was chosen because it is the anniversary of the Occupational Safety and Health Administration and the day of a similar remembrance in Canada. Every year, people in hundreds of communities and at worksites recognize workers who have been killed or injured on the job. Trade unionists around the world now mark April 28 as an International Day of Mourning. Bricks surrounding the Memorial bear the names of 237 fallen IAMAW members from the U.S. Canada along with bricks donated from lodges and proud members of the IAMAW. This April 2007, seven IAMAW members who lost their lives while on the job in 2006 will be remembered by placing bricks bearing their names. Whenever members attend educational classes at WWW, the names surrounding the Memorial remind us that our fight has not yet ended and our dedication to safety and health in the workplace must continue. 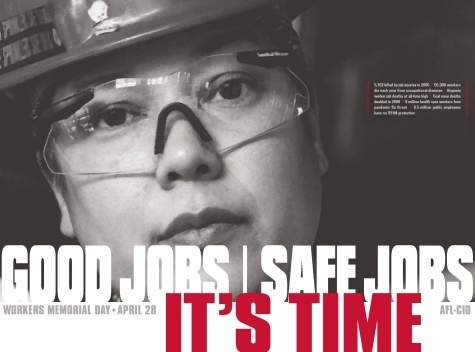 Safe Jobs: Keep on Fighting, a two-page flier from America@work.